This guide contains the whys and wherefores of categorizing the Mac Clean Pro app as a virus and additionally includes simply steps to uninstall it from Mac. There is a huge gap between Mac applications that actually do something and the ones that pretend to. Although genuine optimization tools and scareware that only imitates the process are on the opposite sides of the software ecosystem, it may be difficult to distinguish between the two types. Cybercrooks have gotten fairly competent in coining rogue utilities over time – the Mac Clean Pro app demonstrates this adverse expertise to the fullest. Zooming out a bit, Mac optimization solutions are growingly popular nowadays as they allow for hassle-free system tune-up with very little user involvement. In response to this hype, malicious players are launching counterfeit cleaning utilities in quick succession. One of these campaigns presently in rotation is peddling the above-mentioned impostor program, which emulates a system scan and claims to detect a bevy of issues in order to defraud the victims of money in the form of the license activation fee. The GUI of the Mac Clean Pro virus is tailored to resemble a garden-variety performance enhancement tool, but this external appeal is simply a red herring pursuing a persuasion effect. The alleged feature set is split into four sections, namely Cleaning, Optimization, Manual Cleaning, and Security – each one with sub-elements of its own. The most conspicuous item on the interface, though, is the Clean Now button, and that’s a predictable thing for a phony application craving for the plagued user’s money. With that said, the fundamental component of the raid is the Mac scan that kicks off right after the unauthorized emergence of the culprit inside the host. In order to appear trustworthy, the system checkup takes some time despite the fact that there is no real scan activity going on. Mac Clean Pro is programmed to display the predefined graphics that are supposed to instill a sense of trust. A clever move on the attackers’ end is that the number of detected problems and threats won’t match for different victims, which is the only variable parameter hard-coded into the pest. All in all, the scan workflow is a dummy and the results are bogus, too. Mac Clean Pro may re-infect your Mac multiple times unless you delete all of its fragments, including hidden ones. Therefore, it is recommended to download Freshmac and scan your system for these stubborn files. This way, you may reduce the cleanup time from hours to minutes. Download NowLearn how Freshmac works. If the utility spots malicious code, you will need to buy a license to get rid of it. With regard to the distribution, Mac Clean Pro doesn’t stand out from the rest at all. Its payload is cloaked by layers of tricky installation clients, where the main software is harmless and perhaps even useful but the bundled items are shady to the bone. Staying safe in these cases is a no-brainer and only a matter of selecting the custom setup option that reveals the secret cards. However, not everybody is security-minded enough to go that route, so there will always be people who get on the hook of the bundling stratagem. Anyway, the Mac Clean Pro malware creeps into computers along with other apps that don’t pose any risk themselves. Having completed the sneaky encroachment, it sprinkles its files across different paths on the Mac, including Login Items, in order to maintain persistence and prevent ordinary removal. Fortunately, the situation isn’t as bad as it appears – Mac Clean Pro removal is doable by means of a peculiar technique covered below. When confronted with malicious code like the Mac Clean Pro virus on Mac, you can neutralize its toxic impact by leveraging a specially crafted system utility. The Freshmac application (read review) is a perfect match for this purpose as it delivers essential security features along with must-have modules for Mac optimization. This tool cleans unneeded applications and persistent malware in one click. It also protects your privacy by eliminating tracking cookies, frees up disk space, and manages startup apps to decrease boot time. On top of that, it boasts 24/7 tech support. 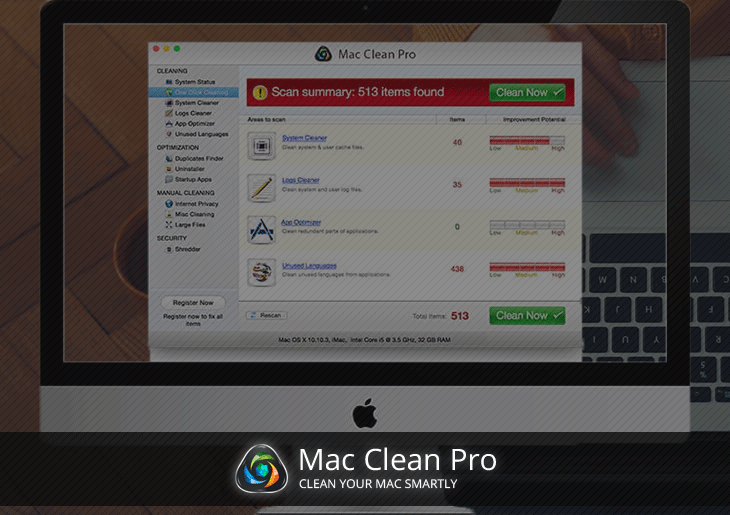 The following steps will walk you through automatic removal of the Mac Clean Pro infection. Check whether the Mac Clean Pro issue has been fixed. If it perseveres, go to the Uninstaller option on Freshmac GUI. Locate an entry that appears suspicious, select it and click Fix Safely button to force-uninstall the unwanted application. Go to Temp and Startup Apps panes on the interface and have all redundant or suspicious items eliminated as well. The Mac Clean Pro malware shouldn’t be causing any further trouble.